In this example you will learn how to create bootstrap 4 tables tutorial with example. The HTML tables are used to display data in a grid manner like row and columns. Bootstrap 4 makes changes to how tables are styled. A primary Bootstrap 4 table has a light padding and horizontal dividers, apply Bootstrap’s .table class to the <table> element. Now we can see the basic example of bootstrap 4 table. You can create the table with an alternate background like zebra-stripes by simply adding the Bootstrap’s class .table-striped to the .table base class. The output of the above example will looks like below screenshot. 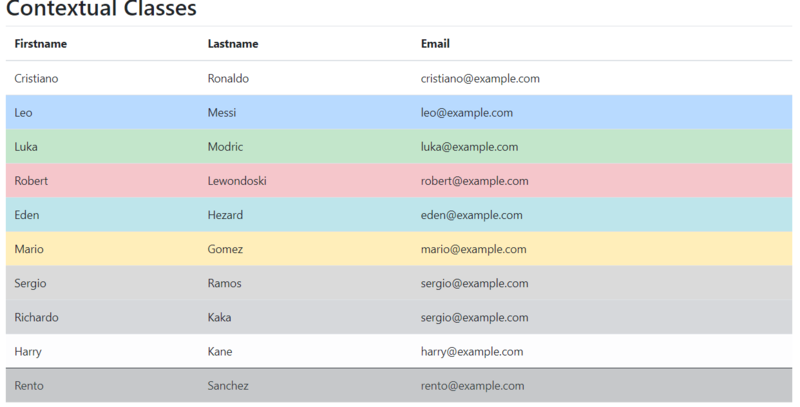 We can also add borders to all table cells by adding an extra Bootstrap’s class .table-borderedto the .table base class. The output of the above example will looks like that. Bootstrap 4 offers an option of adding a hover effect to the table using the .table-hover class. The .table-hover class adds a grey background color on table rows. The .table-dark class adds a black background to the table. Combine .table-dark and .table-striped to create a dark striped table. The output of the above example will look like below screenshot. The .table-hover class adds a hover effect (grey background color) on table rows. At last, our Bootstrap 4 Tables Tutorial With Example is over.